Every fashion girl highly anticipates holiday party season, and New Year’s Eve in particular is the night to go all out and wear your chicest look. To help you navigate the options, we’re calling out coolest colors to wear for NYE. In fact, five colors in particular—purple, bronze, emerald, silver, and rose gold—will be major this year. For a strong classic look, stick with the traditional bronze and silver dresses. In particular, silk, velvet, and sequin dresses styled with minimalistic accessories are the winning formula to try out. From retailers high and low, we’ve rounded up all of the dresses that should be on your radar. Go on to shop our top picks and see the best colors to wear for New Year’s this season. Style this dress with velvet heels. Minidresses are a major NYE trend. A sequin dress is always a chic style. Style this bronze dress with gold jewelry. Take on bold shoulders this year. Opt for bold metallic colors. Style this silk dress with block heels and a velvet bag. Style this dress with simple black accessories. We're calling out emerald as a must-have shade for NYE. Wear this velvet dress with simple pumps. Try this disco-inspired piece on for size. Wear a red lip with this silver dress. 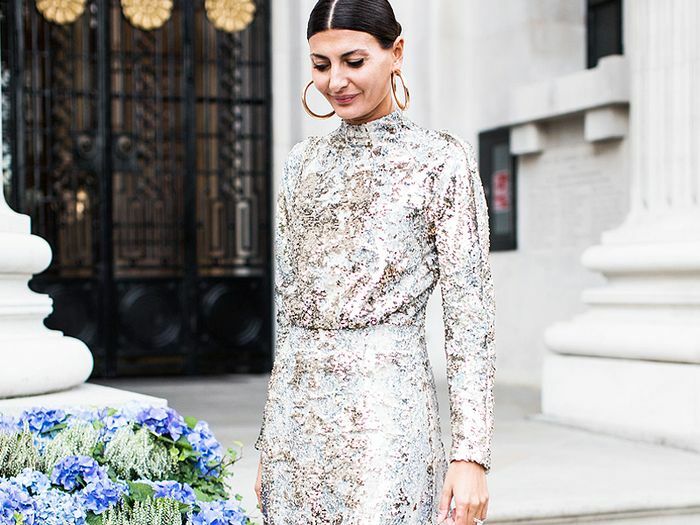 Sequins are a failsafe for NYE. Make a statement this NYE. Metallics are having a moment this season. Style this sequin dress with gold jewelry. Wear your hair in a simple pony with this high-neck dress. Sequin dresses are a strong trend for this holiday season. Next, check out the prettiest denim trend of the New Year.